Welshman Tony Pulis believes Cardiff City need to return to the Premier League to truly put Wales on the footballing map. The West Brom boss, whose side were beaten by Swansea City on the final day, welcomed the Swans' Premier League survival and Cardiff's hosting of the Champions League final on 3 June. But he believes Wales' capital city team must return to the top-flight. "We need to get Cardiff back in the Premier League," said Pulis. Cardiff City were promoted to the Premier League as Championship winners in 2013, but were relegated after only a season in English football's top flight. Born in Newport, Pulis attended Cardiff City games as a youngster, and despite the Bluebirds enduring a torrid 2013-14 campaign he says the club must get back to the Premier League if Wales is to truly establish itself as a footballing nation. The 59-year-old said having the Champions League final, between Real Madrid and Juventus in Cardiff, would be a fantastic occasion. "I think it's important that people realise that Cardiff is the capital city," Pulis added. "It's lovely having Swansea there and they have definitely out-performed Cardiff over the years, but we need to get that city and that football club back into the Premier League. "It (the Champions League final) is wonderful for the country. To have two giants of European football is absolutely fantastic. Cardiff is now a fantastic city with wonderful facilities. "The supporters from Italy and Spain, as long as they behave themselves, will have a wonderful time in the city. Not just watching the game, but they will be welcome with open arms by countrymen who are known for their hospitality and celebration." Pulis saw his West Brom side pegged back by Swansea at the Liberty Stadium on the final day of the Premier League campaign. Despite taking the lead through a a Jonny Evans header, Paul Clement's men finished the season on a high thanks to goals from from Jordan Ayew and striker Fernando Llorente. 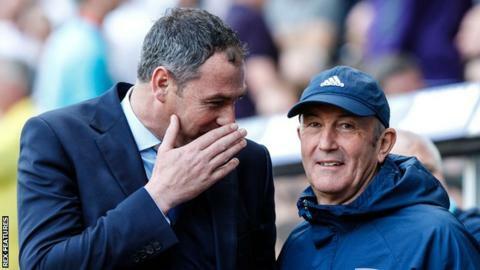 Pulis said he was pleased to see West Brom end up finishing 10th in the table, but was critical of his side's defending and finishing at the Liberty Stadium. "I was disappointed. I thought at times we controlled the game and had fantastic opportunities," Pulis added. "But the last third of the season has highlighted that we need to defend better and when we go forward, take our chances. The first goal they scored was a third division goal. We need a leader, a voice, within the back-four. "We've played well in games, but we've ended up not taking our chances and giving silly goals away which has cost us. "We are disappointed because we've over-achieved this season and we should have over-achieved by more. Finishing 10th is a fantastic achievement by everyone at the club."